Malta u lil hinn minnha (Malta and beyond) is a Sunday-morning prime-time show, on TVM (Malta’s national television station); a weekly magazine which sets to illustrate the essence of the Maltese joie-de-vivre, or in more Mediterraneanistic Italian terminology, bel’vivere. Its aim is to expose the beauties of the islands, which many-a-time go unnoticed by the locals, but attract tourists and repeat visitors time and time again. Thus, Malta u lil hinn minnha regularly projects some of the most scenic spots of the islands, views whose silence has tales to tell, places whose activity brims with vitality, and spaces where time stands still. From the makers of the award winning Kenn il-Bahhara, Ghawdex Illum, Malta Grajjietha, Zmeraldi and Ix-Xoghol Wahdu Jurik....the new award winner for culture journalism in Malta: MALTA U LIL HINN MINNHA. CVC Media have been yet again entrusted to produce the seveth series of the marathon Sunday morning cultural television programme for TVM, malta`s national TV network. The series is once again being filmed and edited on the broadcast High Definition platform in which, CVC Media are leaders in Malta. The programme includes features of an agro-environmental nature, countryside and urban walks, historical heritage information, publications and hobbies, the popular weekly slot focusing on traditional Maltese recipies, promotion of Malta's and Gozo's towns and villages, as well as the highly informative features on world culture and civilization, as well as meeting with Maltese emigrants abroad. The thirty nine 70 minute programmes are hosted by Denise & Paul Mintoff, Katya Scicluna, Cynthia Zerafa, Valerie Vella, Mario Coleiro and chef George Borg...all familiar faces on national television these recent years. Accompanying the presenters is a twenty strong team led by producers George and Alvin Scicluna who is also the series director. Both series produced to date have won Malta's Best Cultural Journalism. For yet another year, the series enjoys part sponsorships by leading agencies - both public and private, who are convinced that the fare provided is not only entertaining but visually educational. 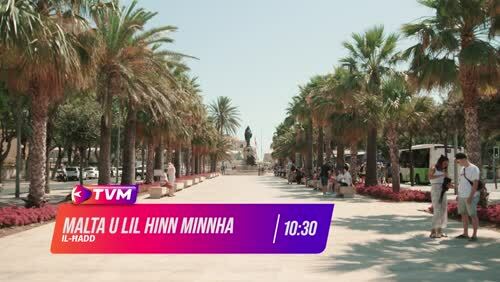 In truth, Malta u lil hinn minnha portrays what is best in Malta's identity and even beyond!